Check out the top sellers in the iPhone App Store and you’ll see dozens of games with names like Tap Zoo, Tiny Tower, Farm Story, Pet Village, Zoo Story, My Cafe, Tiny Farm, My Zoo, Tower Village, My Farm, Zombie Story and Zombie Zoo Pet Village Cafe Story Farm. What do these games all have in common besides a repetitive naming scheme? They’re all freemium games, which is a term meaning a game that’s free to play, but costs money to enjoy. I’ve talked about these games before, but they’re not going away, so I’m giving them another look. This particular variety of freemium game is called a “time management” or “social” game, in spite of the fact that they’re popular primarily with antisocial people who don’t manage time well. 2. Wait for a period between 30 seconds and three days. 3. Be reminded that you wouldn’t have to wait if you paid real money. 4. Acquire something that doesn’t actually exist. 6. Return to No. 1. So your choice is either to play a free game where you have to spend endless hours waiting for boring things to happen, or a startlingly costly game where somewhat less boring things happen at a much faster clip. In fact, if you’re really dedicated to the game and not at all dedicated to fiscal responsibility, you can pay hundreds of dollars to zoom through the content faster than it takes to finish a level of an actual legitimate game like Plants vs. Zombies. 1. Millions of people will download so-called games that provide no challenge other than explaining to your boss why you’re harvesting radishes in the middle of a client meeting. 2. People who are too cheap to pay a dollar for a game will eventually spend gobs of money on imaginary possessions. 3. People who really love a game will pay for it to be over faster. Well, far be it from me to argue with what Adam Smith called “The Invisible Lobotomy Pick of the Marketplace.” If people want free things that cost money, I’m going to be there with a credit card reader and a smile. An actual physical restaurant where the food is free, provided you’re willing to put up with incredibly bad service. The waiter won’t get to you for at least 20 minutes, your order won’t arrive for a couple hours, and dessert will take three days of sitting around. Sleeping bags not provided or allowed. However, if you buy Bistro Buxx at the rate of one Bistro Buxx — Bistro Bukk? — for every 10 real American dollars, you can then trade those Bistro Buxx for attentive service, hot entrees delivered quickly, and restroom access. And isn’t that a small price to pay for free food? There are millions of actual pets that need homes. It’s tough to even give away cats and dogs, though, much less charge for them. The problem with real pets is that they bug you for food and attention when you’re trying to take care of your animated pictures of pretend pets. 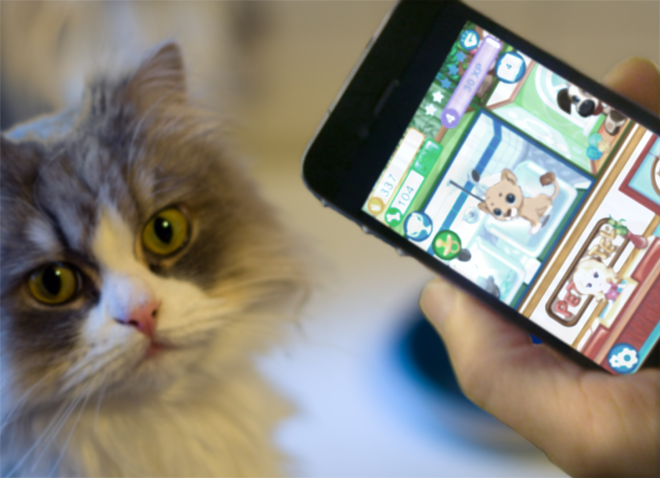 The solution is clear: Let people download a free pet-shelter game, then collect the money they throw at you to buy cartoon cats and dogs and use it to feed, shelter and rub the bellies of real actual cats and dogs. Plus, I get a piece of the action. Hey, this is a charity, not a handout! One of the most heated political discussions of our time is whether health care should be free and incredibly inefficient, or expensive and incredibly inefficient. I offer a third path. We give everyone whatever health care they need, and we pay for it by selling meaningless status symbols to those with too much money and an obsessive personality. You can get a perfectly workable cast for your broken leg for free, or you can get a silver turbo cast with flames and spikes for only $10,000! Why have your appendix simply removed when you can have it replaced with a small statue of an adorable Siamese cat for a mere million bucks? Think of the envy of your equally shallow neighbors! The App Store shows us that status-seekers and compulsive collectors will gladly hand over enough money to keep things free — and incredibly inefficient, of course — for the rest of us. Plus, I get a cut. Image by Lore Sjöberg, from photos by Christian Scheja and Global X. Born naked, hungry and unable to provide for himself, Lore Sjöberg overcame these obstacles to become a philanthropist, a philosopher and a philodendron.